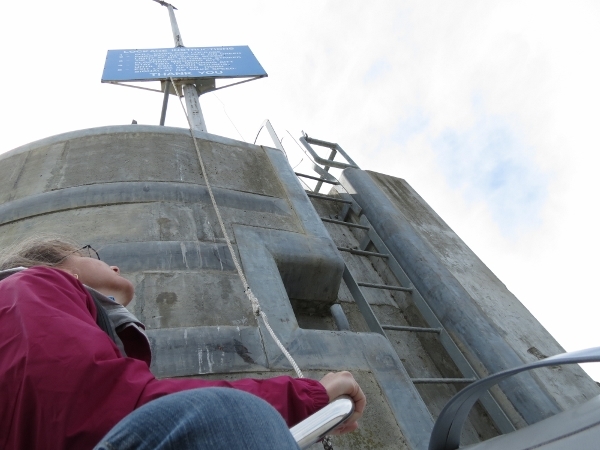 At our final anchorage along the Snake River, we biked to the Ice Harbor Dam visitor center, and also learned firsthand about goat head stickers. Passing through those locks the next day, we hit an all-time speed record for our boat of 15.1 knots. 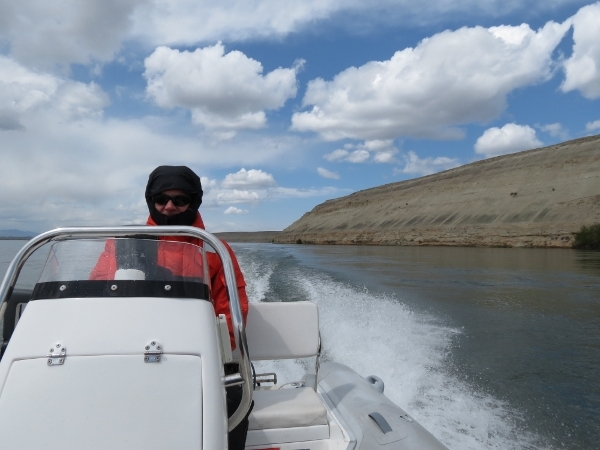 We spent the following two days in the Tri-Cities area, touring Richland and making an eighty-mile return dinghy tour through Hanford Reach to view the old plutonium reactors in the Hanford Nuclear Reservation. 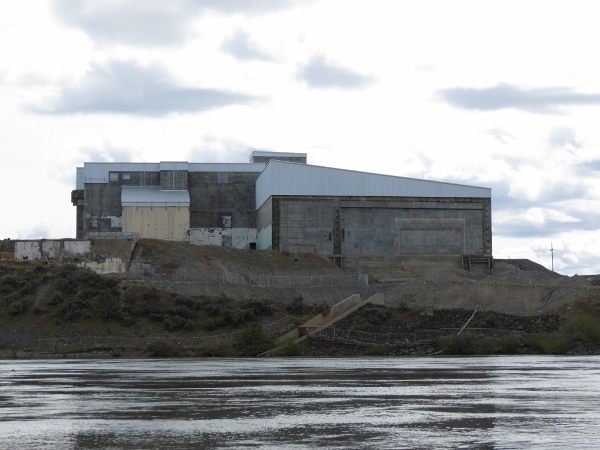 Pictured above is F reactor, one of the nine that once operated on the reservation. Here’s our log from Orchard Cove to the Tri-Cities. You also can display these on the map view. A short run today to anchor off Charbonneau Recreation Area. The park is a couple of miles off Ice Harbor Dam, visible in the distance. 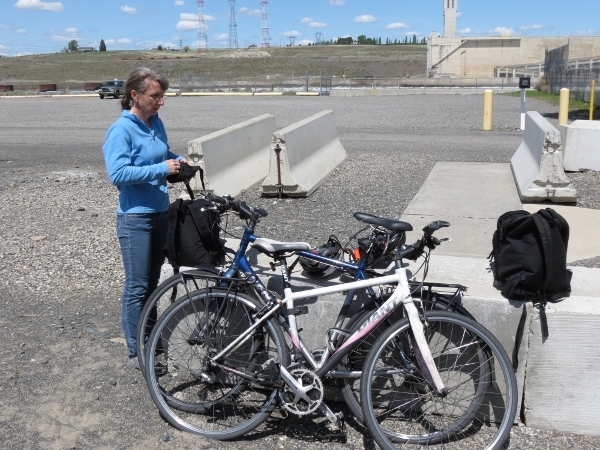 We plan to bike in to get a close-up view of the dam and to tour the visitor’s center. 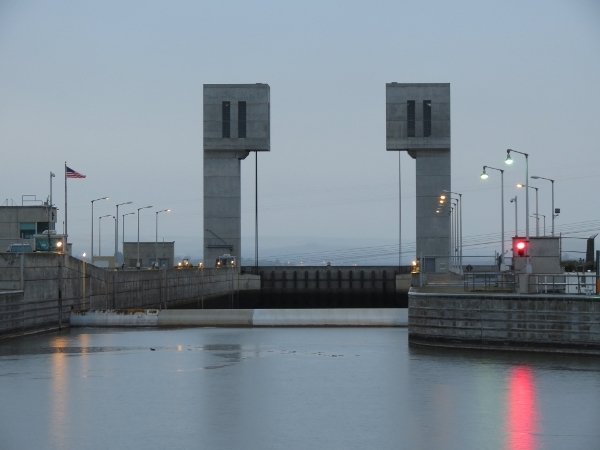 We quite enjoyed this anchorage, particularly the view to the lock and dam all lit up at night. View across the dam from a lookout point above. Whimsical mailbox for the facility. 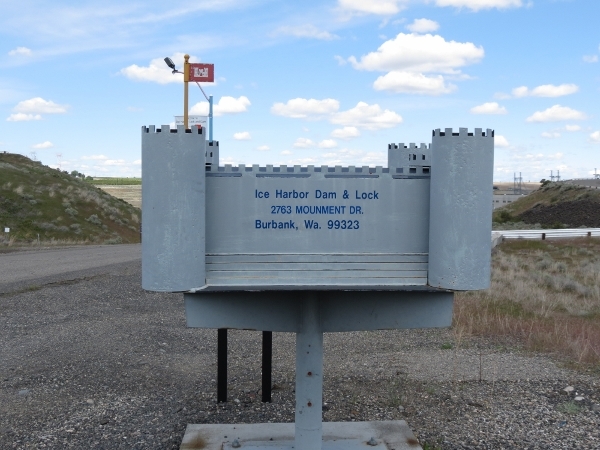 The Ice Harbor Dam visitor center is unfriendly to those arriving on bicycle or foot. No cameras or bags, even purses, can be brought inside. They had no place to lock our valuables and would not allow us to even put them inside the gate. We could only bring in what would fit in our pockets–fortunately my wallet did. So we locked our bags to our bikes, with our camera and cell phones inside, and hoped for the best. This time of year, only the visitor center is open. 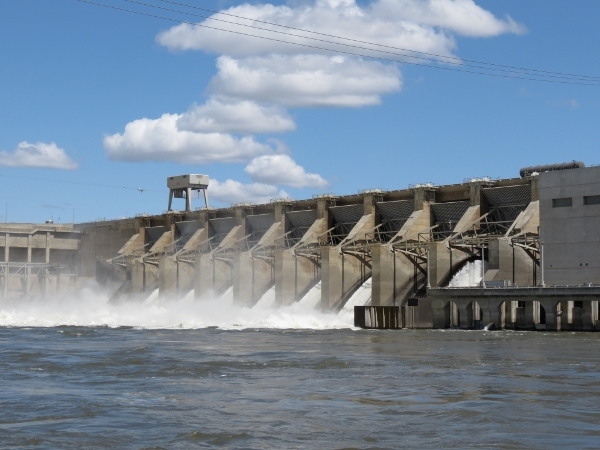 When more visitors are about, tours of the powerhouse are available. 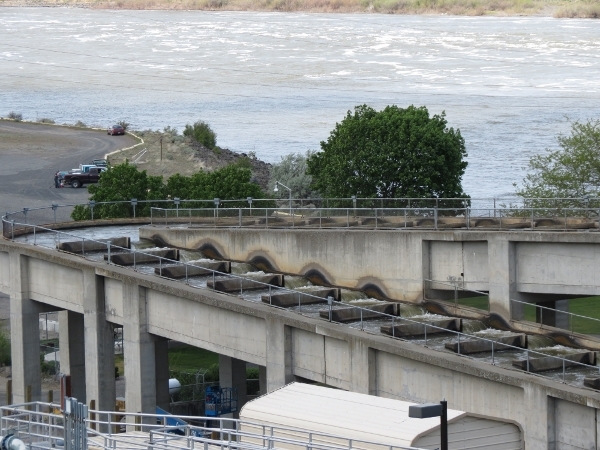 We did enjoy our visit and view of the fish ladders outside and a glimpse through the windows to the first of the spawning salmon heading upstream. The center also had some good displays of how the dam worked and pictures of its construction. View to the spillway from outside the visitor center. 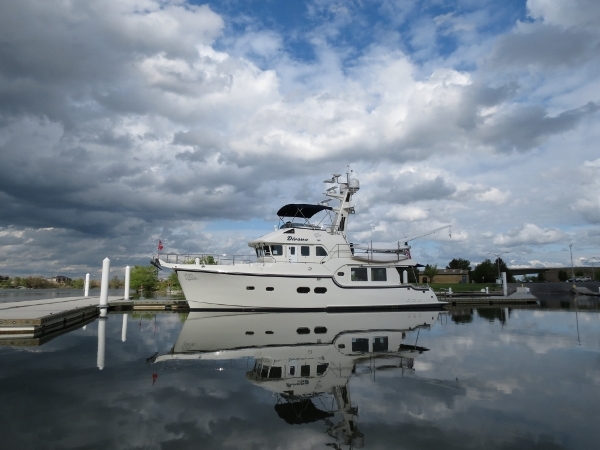 Recreational vessel working against the curent into the locks. This was the third of three entering together. 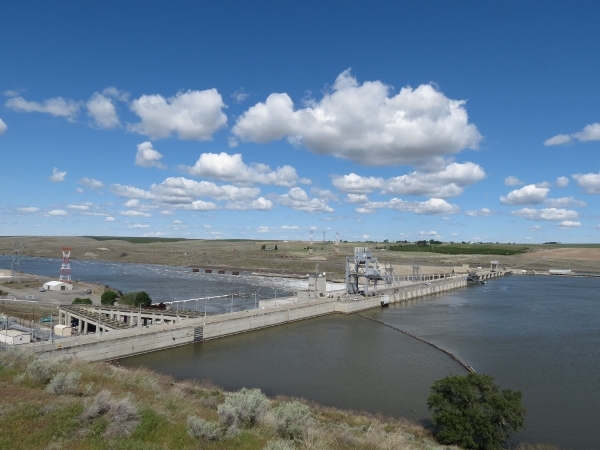 View into the fish ladders from a road above the dam. 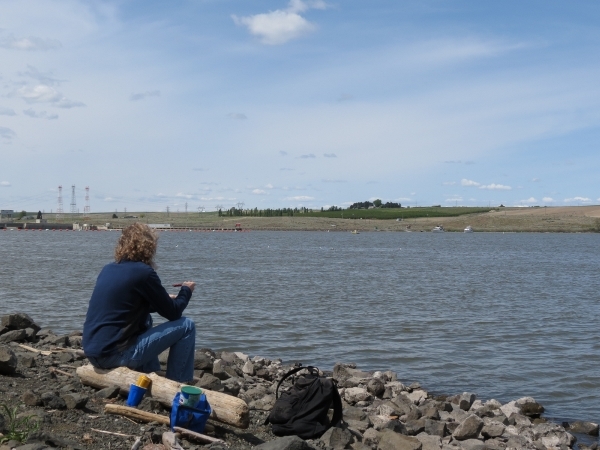 We zipped over to a small park just upriver of the dam for a picnic lunch while watching the boats leaving the locks. 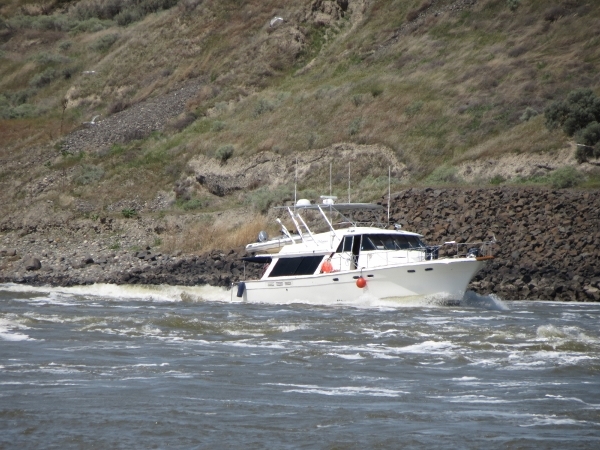 One of the boats, not shown, dropped a fender while leaving the lock. The other two are trying to retrieve it. 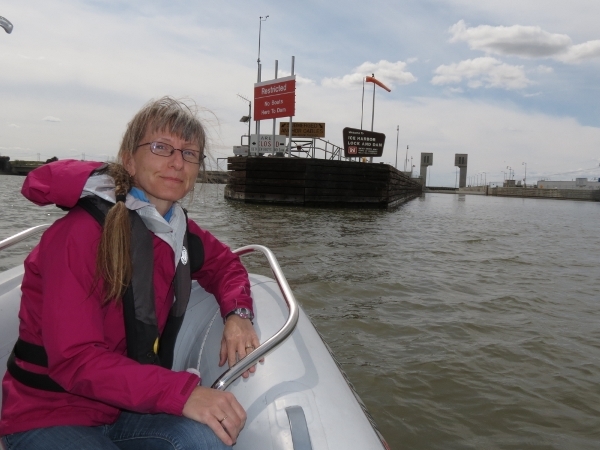 Touring the lock area by dinghy after we’d biked back to the park. 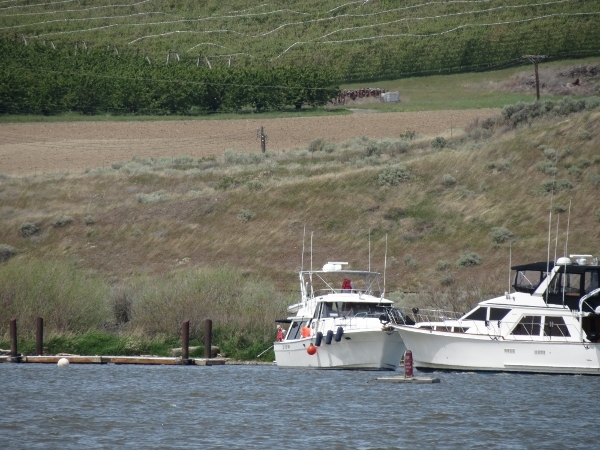 Boats with no radio request lockage by pulling this cord just outside the locks and waiting for a green light to enter. The instructions are on the sign above Jennifer’s head. 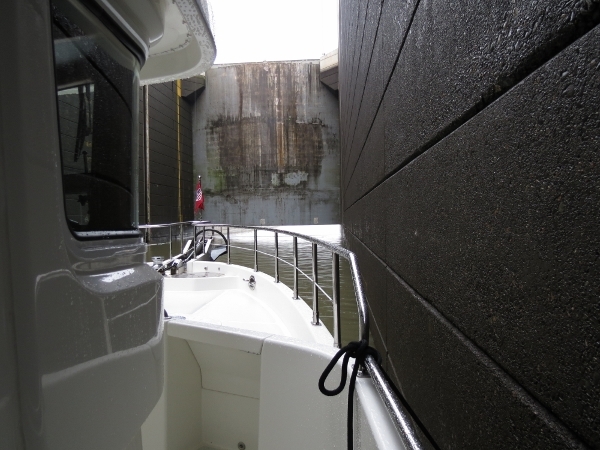 We landed at a boat ramp and walked up to check out the locks from shore. We couldn’t get close enough to see inside, but did get a nice view across the locks and downriver. James’ bicycle tire had gone flat on our last landing at the launch ramp next to the locks. 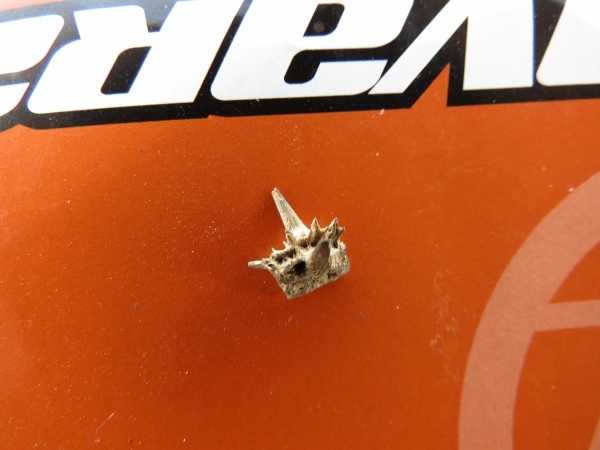 After replacing the tube, we found a goathead sticker in the tire. We’d heard these mentioned before, but didn’t know what they were. At the visitor center, someone even asked if the stickers didn’t get into our tires. Now we know what they were talking about. :) Fortunately our tires are Kevlar-reinforced, otherwise we’d probably have gotten more flats over the course of the trip. Early morning locking. Here’s a short video showing part of the descent–we were dropping quickly and the noise was quite loud. 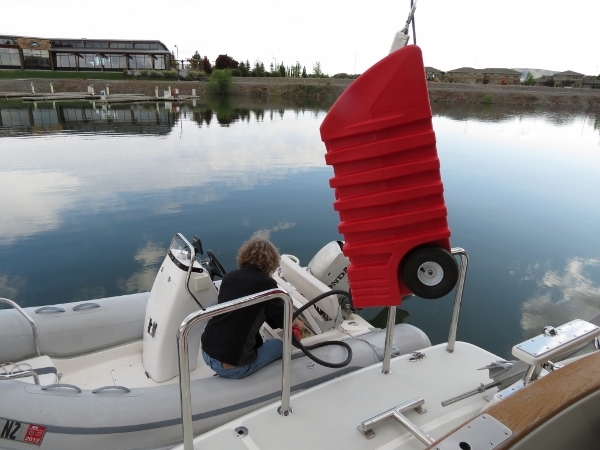 We eventually adopted a system of tying the boat slightly looser then before and using the thrusters to keep us off the wall. This was particularly helpful going down, as the fenders tended to roll up the wall and then pop loose. 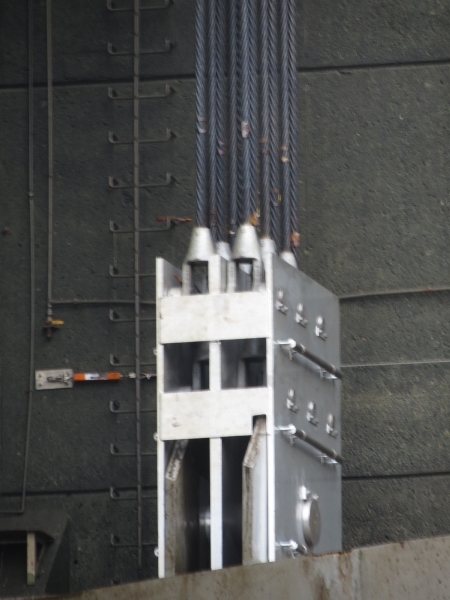 The heavy cables that support and lift the lock door. We got up to 15.1 knots this time. 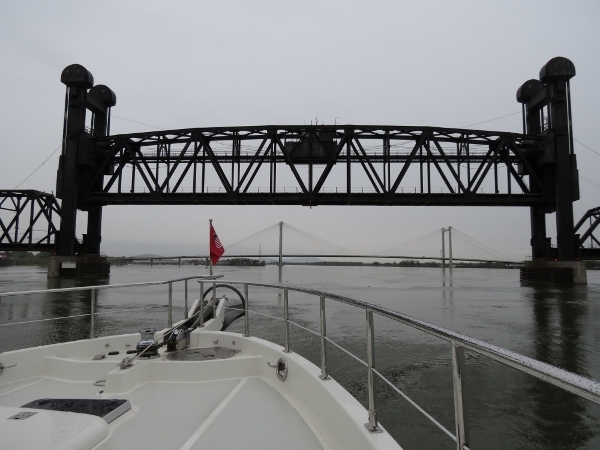 Heading under the Columbia River railroad bridge, with the Ed Hendler Bridge in the background. 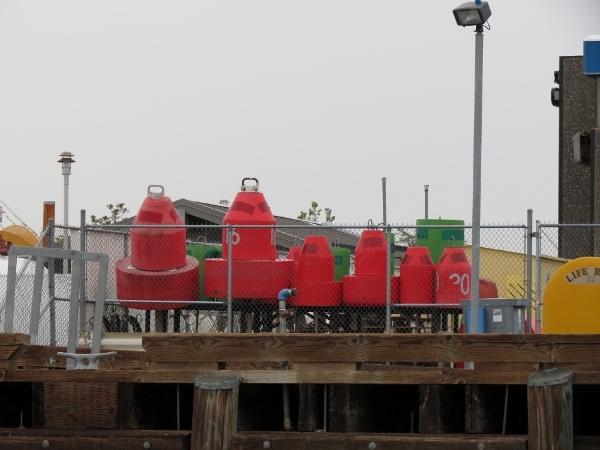 Navigation buoys at the US Coast Guard Aides to Navigation Team Kennewick on Clover Island. Pit area for the annual Columbia Cup unlimited hydroplane races. This year will be the 47th running. 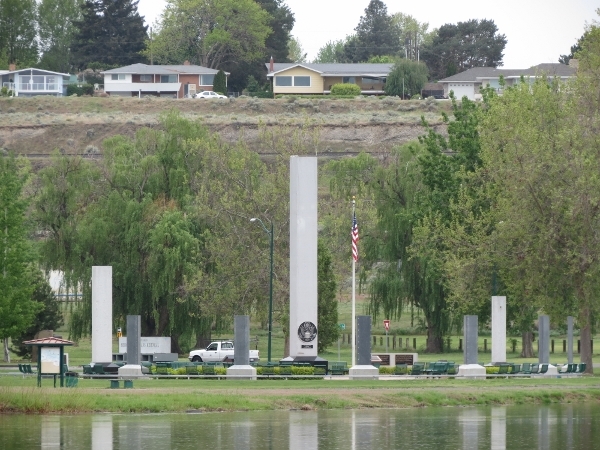 Tri-Cities Regional Veterans Memorial at Columbia Park. The centerpiece is a 44-ton granite column standing 40 feet tall. 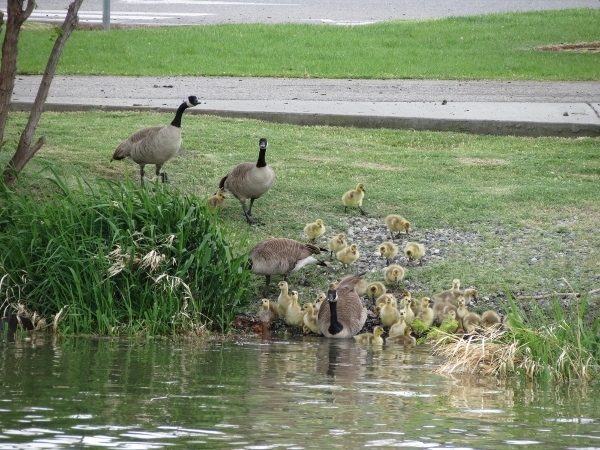 Geese and goslings pour into the river at Columbia Park Marina. 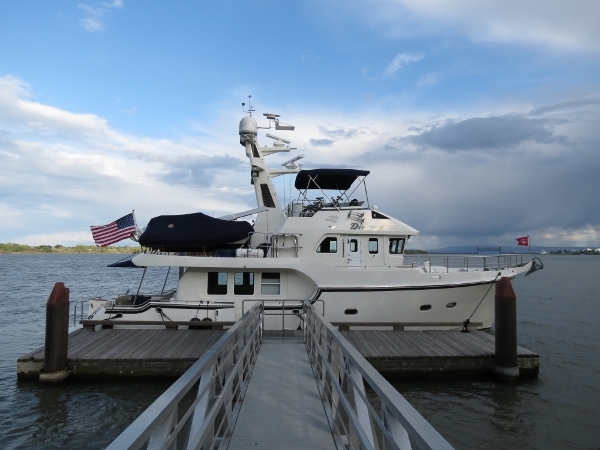 Moored for the night on the public docks in Richland. These docks apparently get quite busy in the summer, but we’re the only ones there now. 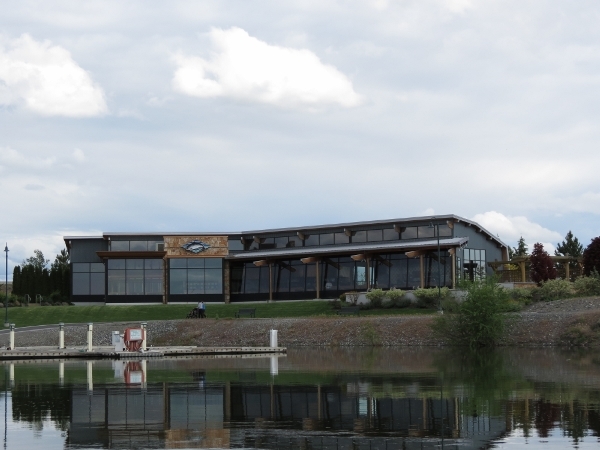 The Richland Yacht Club has an impressive facility in the same basin just to the north. 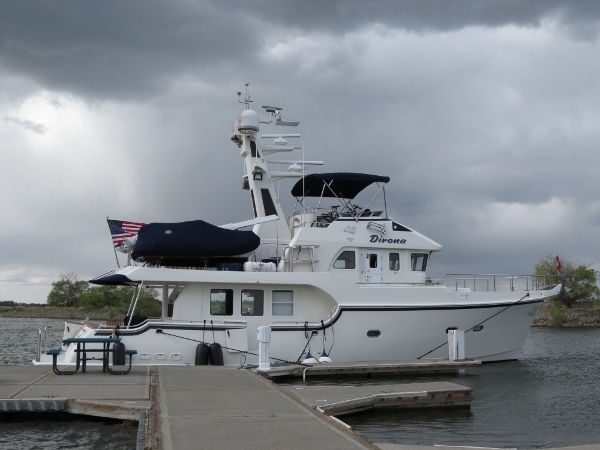 They are a friendly group–one of their members stopped by to say hello and to offer us moorage or any other assistance if we needed it. 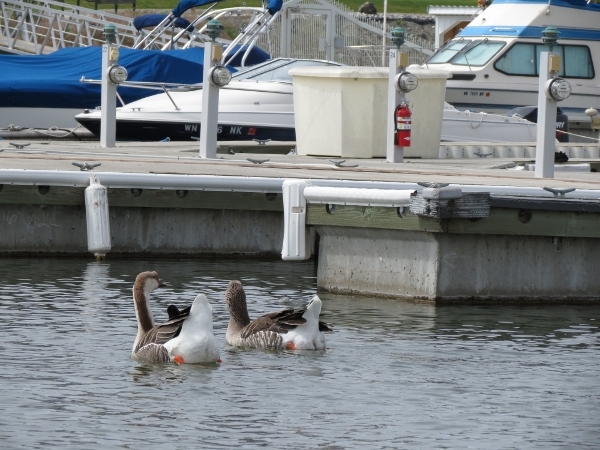 Unusual geese-like birds in the basin. They’re very distinctive-looking, but we couldn’t identify them in our bird books. 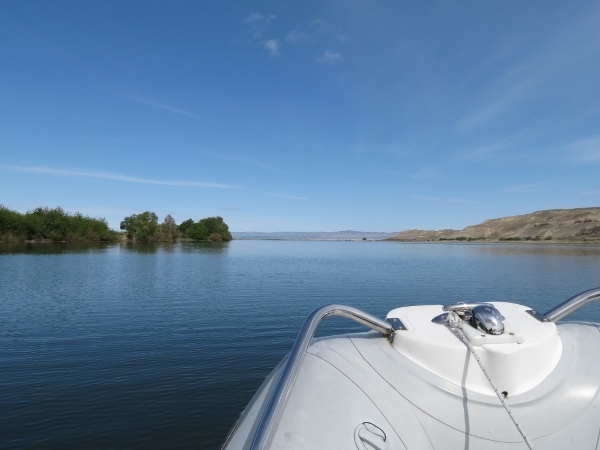 We set off in the dinghy for a run up Hanford Reach, but turned back after about 45 minutes because we were getting too cold. We’d brought extra layers and gloves but, running at speed with rain and strong winds, they weren’t enough. We landed at the public dock at Howard Amon Park to walk into town. 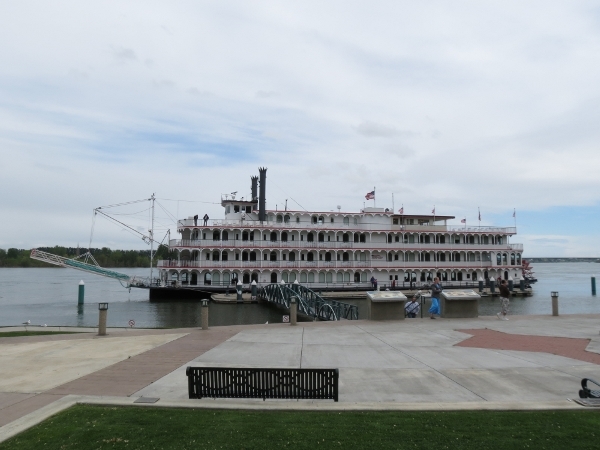 Shortly after we’d arrived, this American Cruise Lines sternwheeler Queen of the West arrived. It does seven-day runs between Portland and Clarkston. The captain docking from a bridge wing. 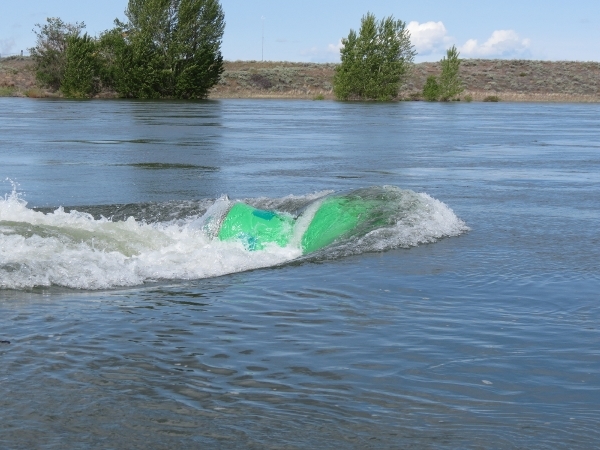 The current was running several knots next to the dock–he did a good job of bringing it in. 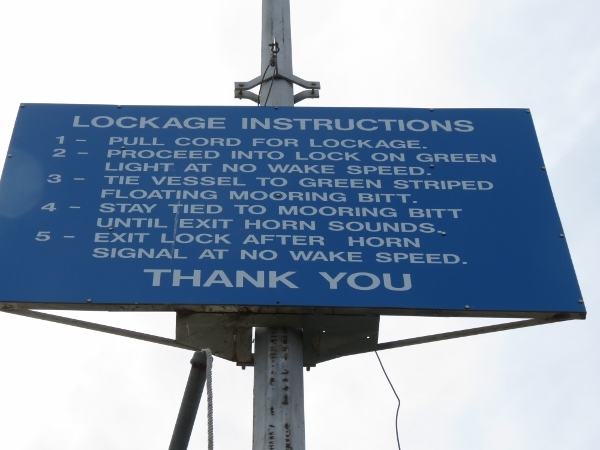 The dock has no signs indicating any moorage restrictions, and we thought it might be a good place to dock Dirona. 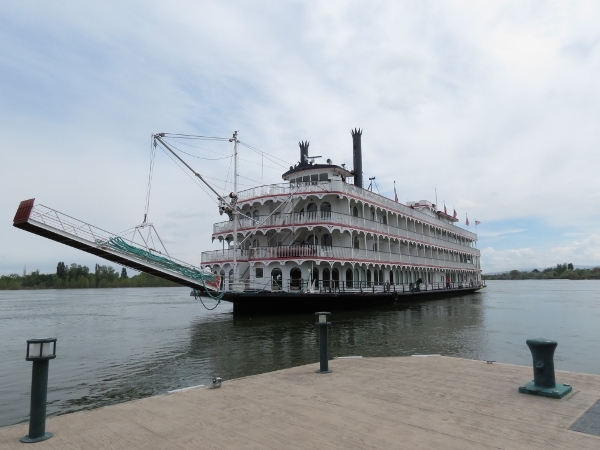 But we’re not sure what would have happened if we had and that sternwheeler arrived–it requires the whole dock. 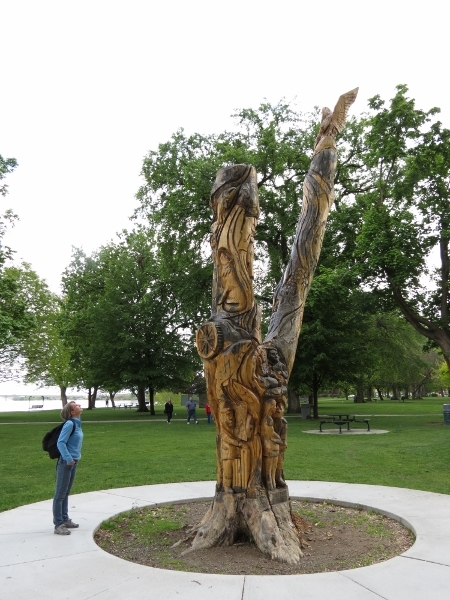 The park has at least two intricately carves trees like this one. 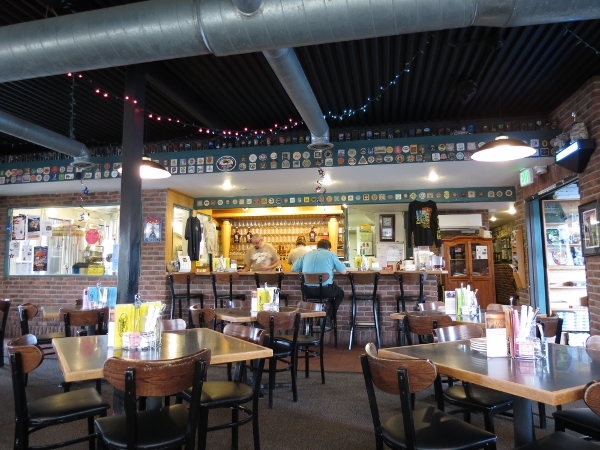 We had an excellent lunch and pints at the Atomic Ale brewpub a short distance from the park. 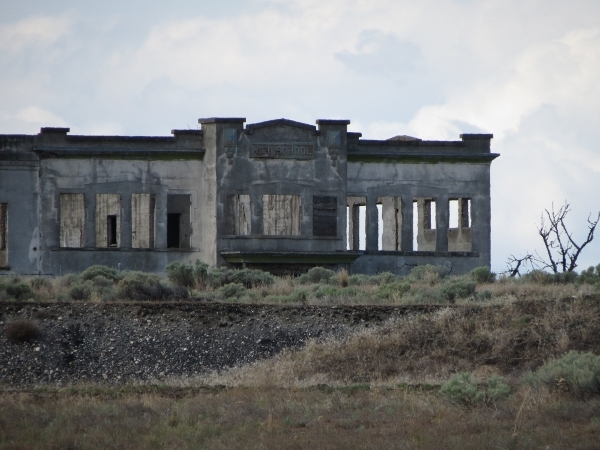 Richland was one of three towns that the US Government took over for the Hanford nuclear energy project in WW II. After lunch, we visitied the Columbia River Exhibition of History, Science and Technology Museum to see their excellent Hanford exhibit. 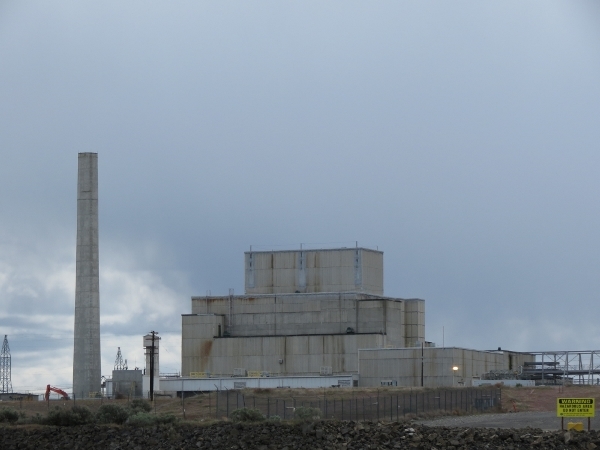 The exhibit details the history and technology of the Hanford nuclear reservation in photographs and detailed displays. 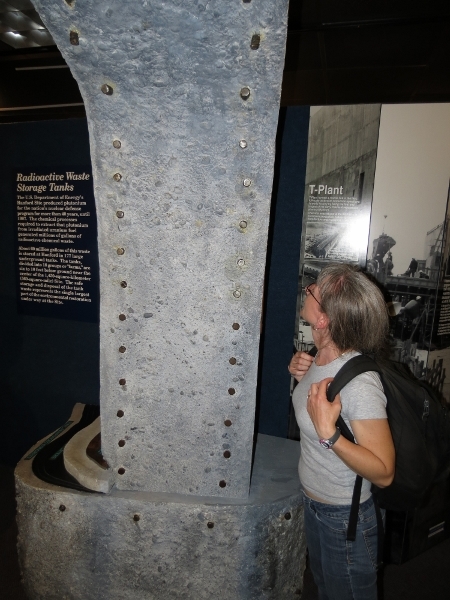 Here, Jennifer is standing beside a lifesize reproduction of the original reinforced-concrete waste containment vessels at the site. James tries his hand at the manipulator arm. It was suprisingly easy to operate. 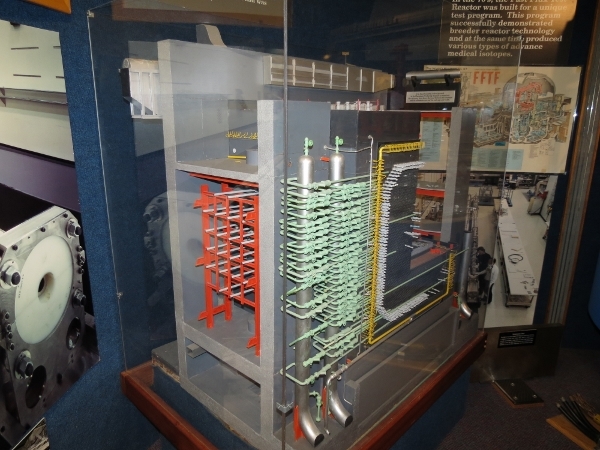 Cutaway display showing a reactor core. 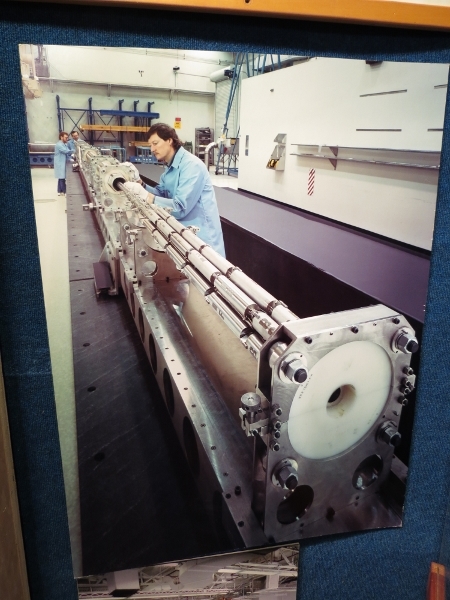 Photograph of a fuel rod under construction. One display had a geigercounter with various items to test it with. 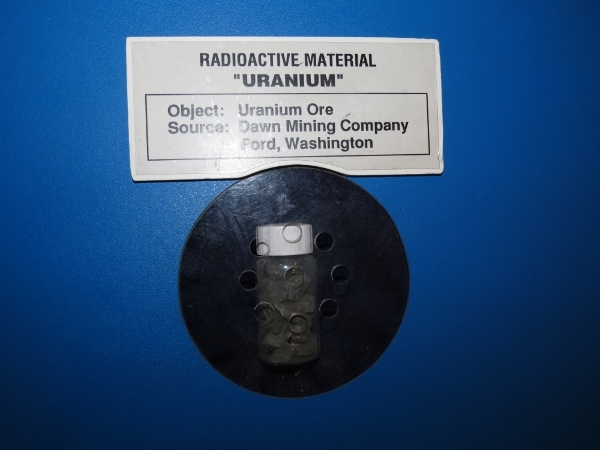 This glaze in this Fiesta Ware actually had higher uranium levels than uranium ore. The company stopped using that glaze. We generally prefer to go through a museum at our own pace without a guide, but when one of the museum hosts offered to take us through, we accepted. We soon became somewhat ‘suspicious’ of our guide. We like to know how things work, and quickly reach the limit of most guide’s knowledge. But Bob Meichle could answer any of our questions in tremendous detail. It turns out he is a nuclear physicist, who worked on the site for years starting in the 1950s. We thoroughly enjoyed our visit, and Bob was a major part of that. 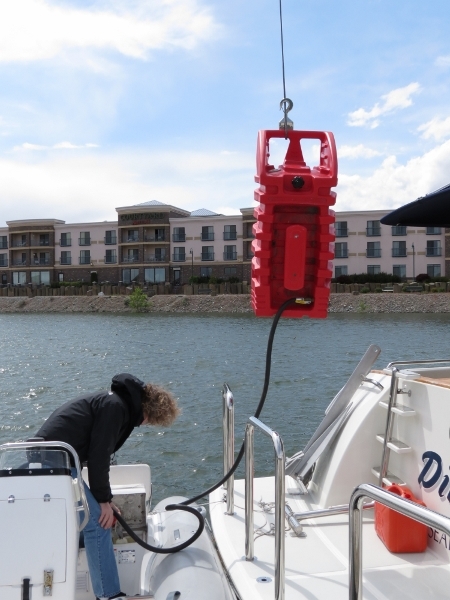 Refueling the dinghy from our bulk storage tanks. We’ve found that hanging the tank from the crane and gravity feeding is very efficient. 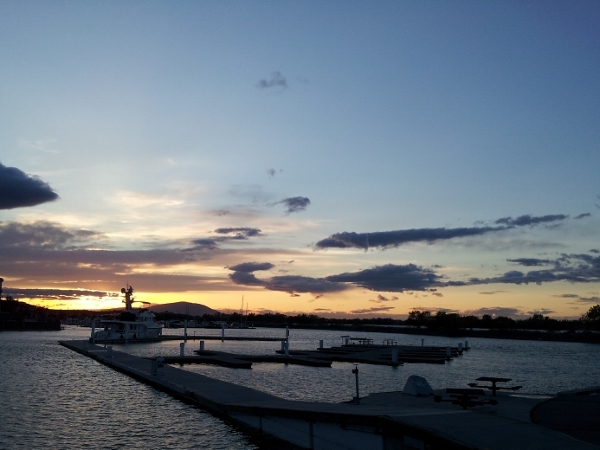 We finished the day with an excellent dinner at the Anthony’s restaurant overlooking the marina. 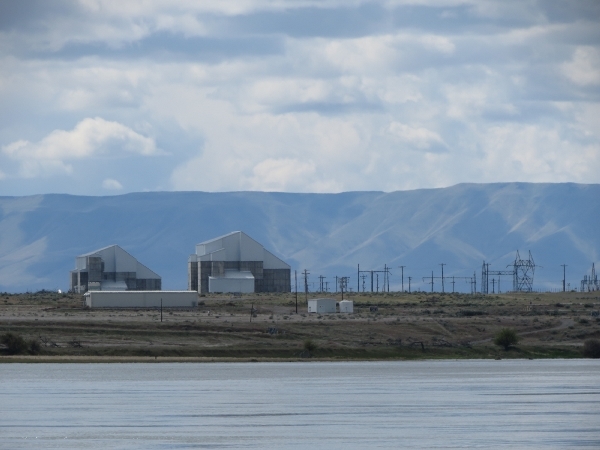 At the Hanford exhibit yesterday, we learned that the plutonium reactor buildings of the Hanford site still stand and can be seen from the water. 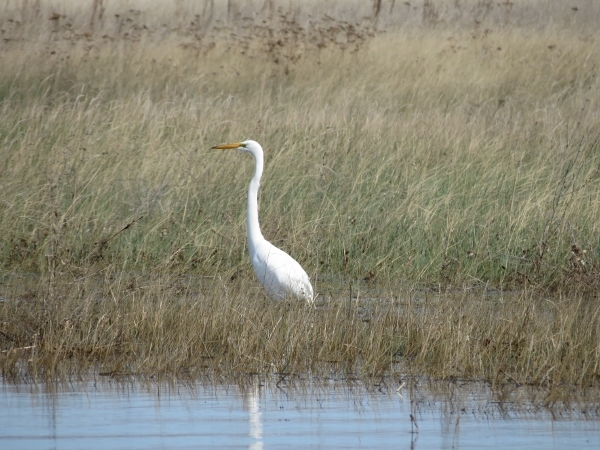 We really wanted to see them, so we prepared better for the temperature and set off this morning on a second attempt to tour Hanford Reach. We had on our Mustang 2175s over a fleece jacket and windbreaker, with ear warmer and gloves. That did the trick. We weren’t cold, but we weren’t hot either. 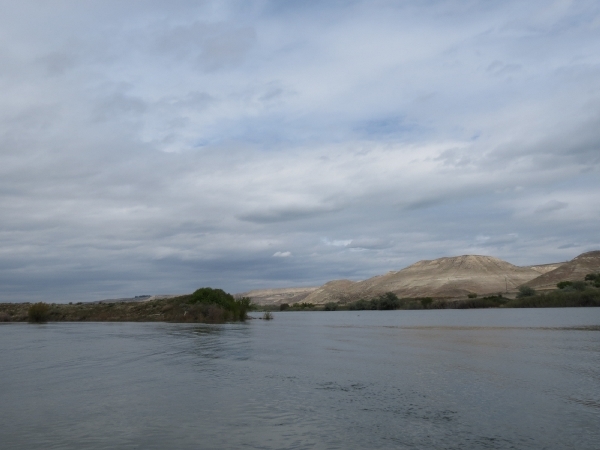 The Hanford Reach is the last free-flowing, non-tidal section of the Columbia. Free-flowing is right– way past where the navigation charts end, this and another buoy were well under water. The weather started out well. Even with sun shining and the temperature in the high 60’s, it is quite cold when running at 30mph. But we’re warm and comfortable in the suits. Old Richland High School building from before the government took over the site. 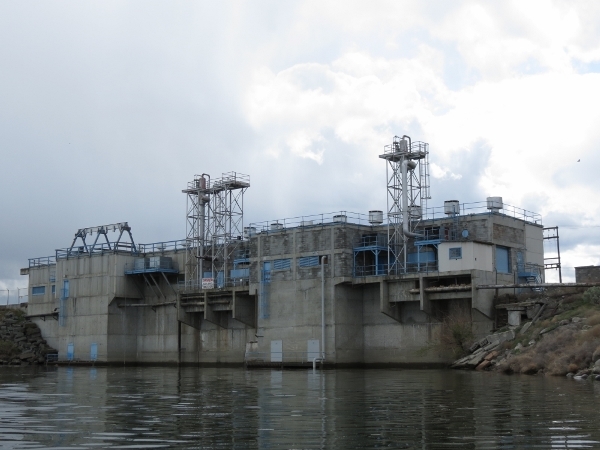 It’s a bit of a paradox, but because of the nuclear project, the Hanford Reach has been undredged and undeveloped. Wildlife has thrived. 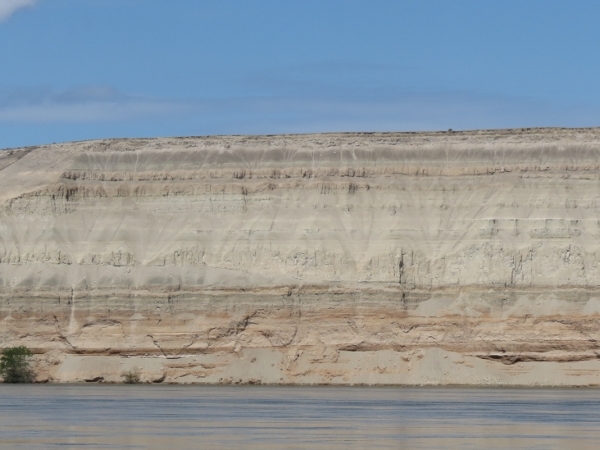 These dramatic white bluffs stretch for five miles along the river near the reactors. 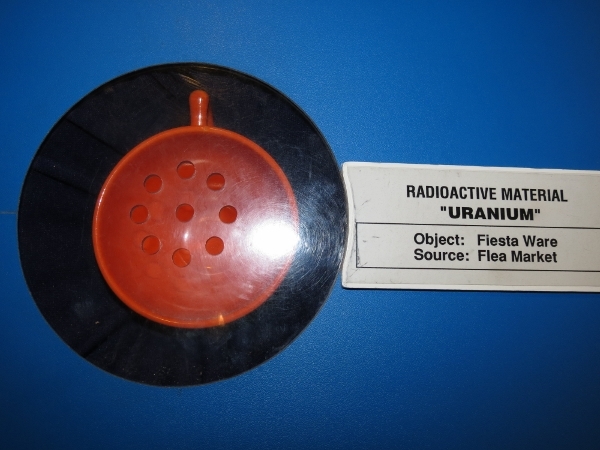 F Reactor, decomissioned in 1965. The structure looks quite different from what it would have when it was in operation. 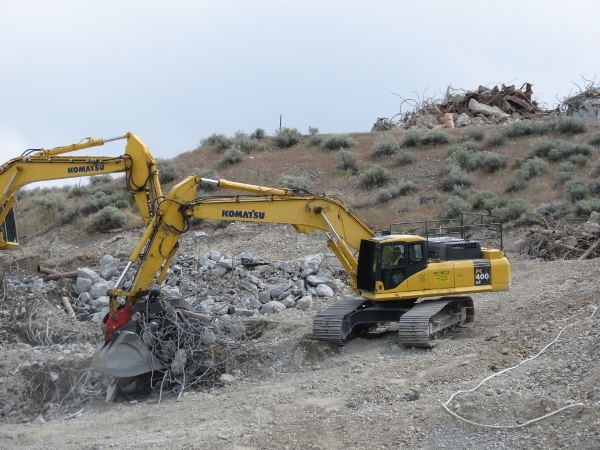 In a process called cocooning or entombment, the building is demolished to the 4-foot-thick reactor core concrete shield, any holes are patched, and a new roof is added. H Reactor also has been entombed. 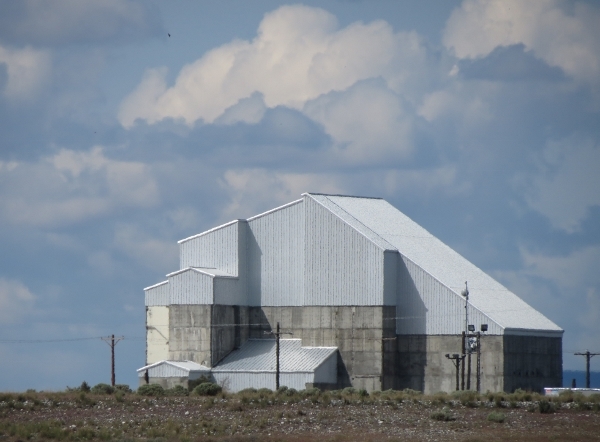 When a problem was found with the D reactor, the DR (D replacement) reactor was built beside it and became the fifth operating plutonium reactor on the site. 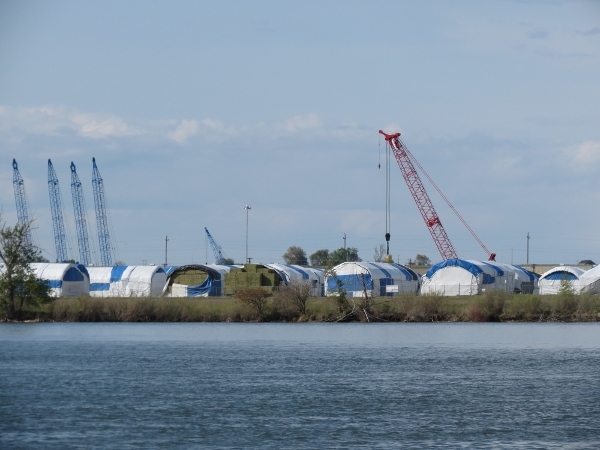 The issue with D eventually was resolved, and both reactors were run until the mid 1960s. 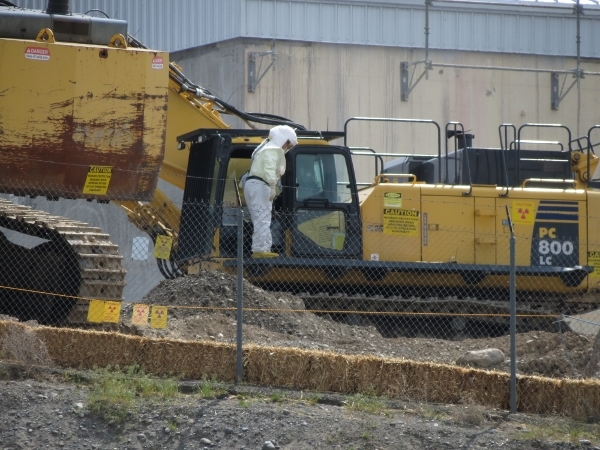 Grappler picking up scrap material around N Reactor. 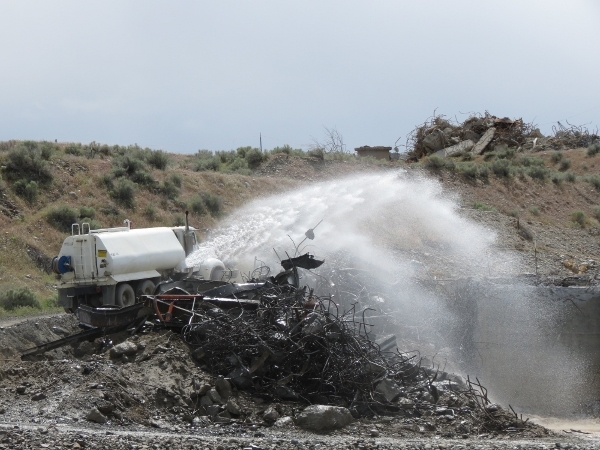 Watering down the soil to limit dust in the air. When we saw this, we figured it probably wasn’t a good area to be around for too long. Big pump house. A similar, slightly smaller one, is downriver. 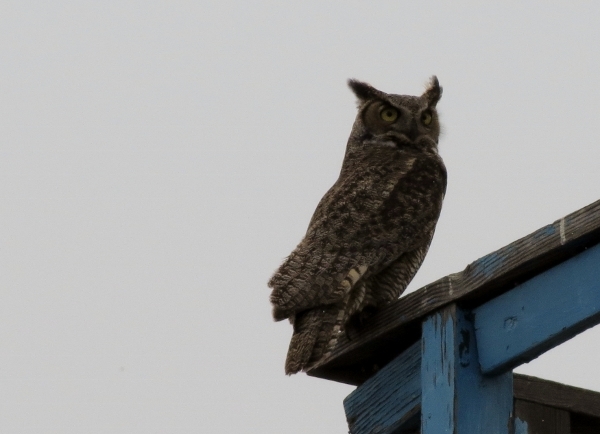 Owl at the pump house. 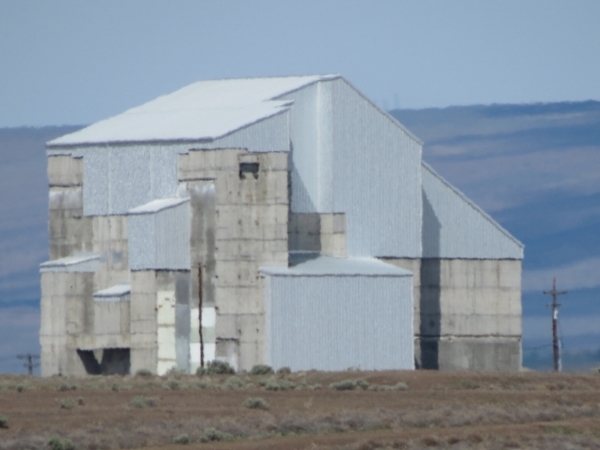 B Reactor is a National Historic Landmark. Now a museum, it was the first plutonium reactor ever built and is notable for being a source, along with F and D, of the plutonium for the Fat Man atomic bomb dropped on Nakasaki, Japan in 1945. 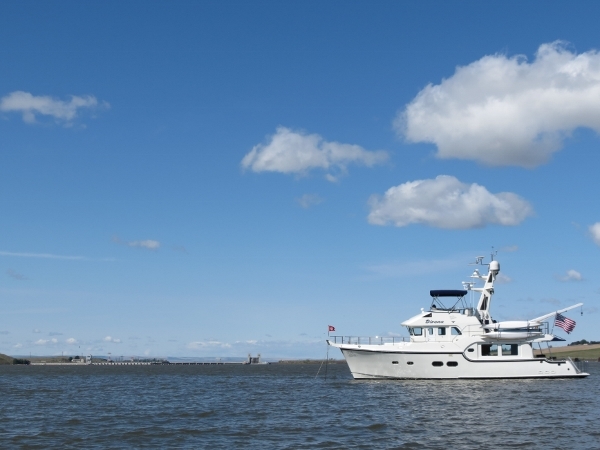 We’d left this morning with a full ten-gallon tank in the dinghy, and brought an extra five just in case. 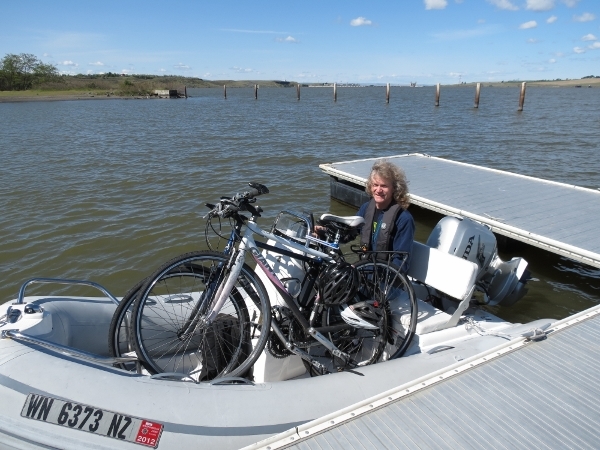 We ended up using all the dinghy fuel and a good portion of the extra on the eighty-mile (return) run. We had no power or water at our dock, so we stopped at the end of another to fill our water tanks before leaving the area. 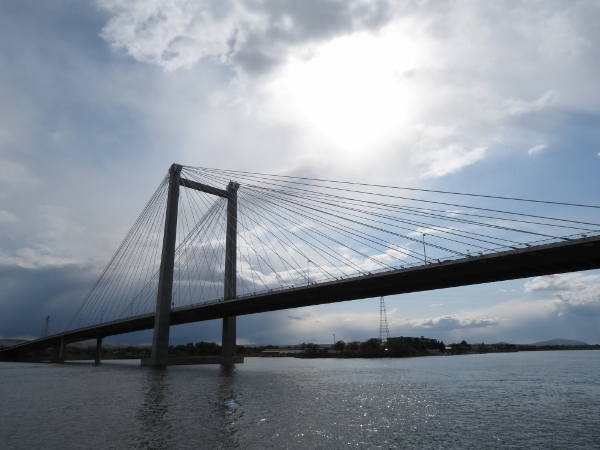 The Ed Hendler Bridge was thought to be the first cable-stay bridge in the country when completed in 1978. 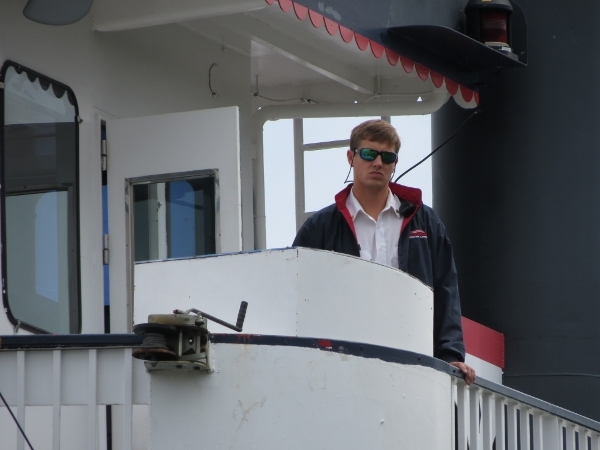 But the little-known Captain William Moore Bridge had been built near Skagway Alaska three years earlier. 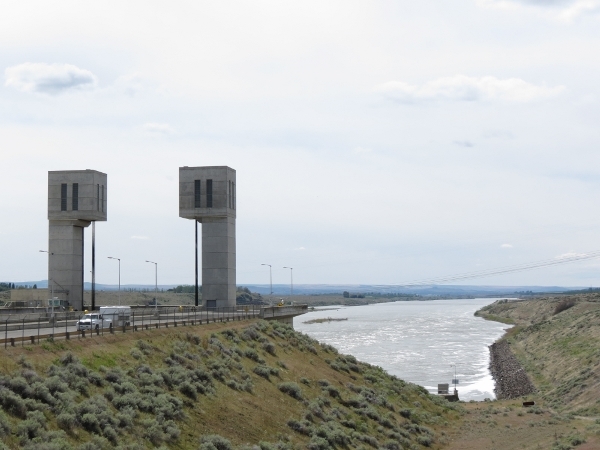 The Columbia River railroad bridge was down when we approached. 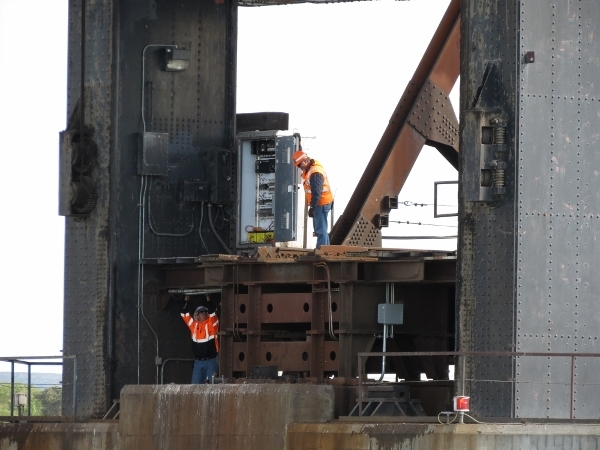 When we radioed for an opening, the bridge operator told us they were working on a problem with the bridge and it might be 30-45 minutes before they could open it. But they were able to open it intermittently and did so when we arrived. Bales and bales of hay stored along the south shore. 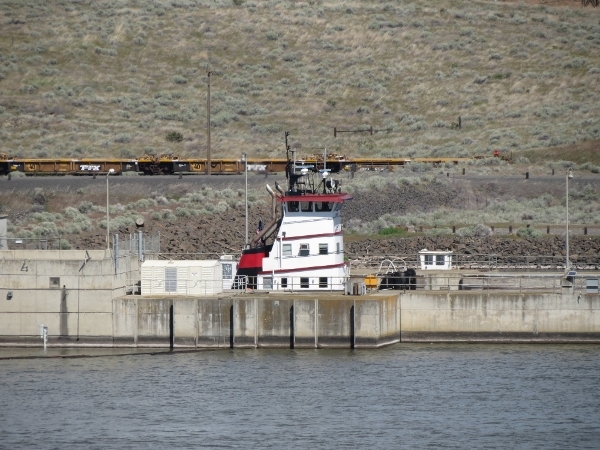 We spent the day touring Hanford Reach, and now are moored for the night on the park’s Snake River South dock. 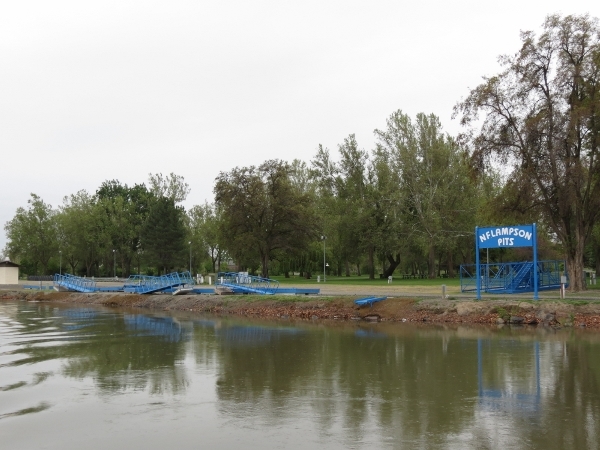 The park was established in the 1920s and had extensive, well-maintained grounds and several historic buildings. 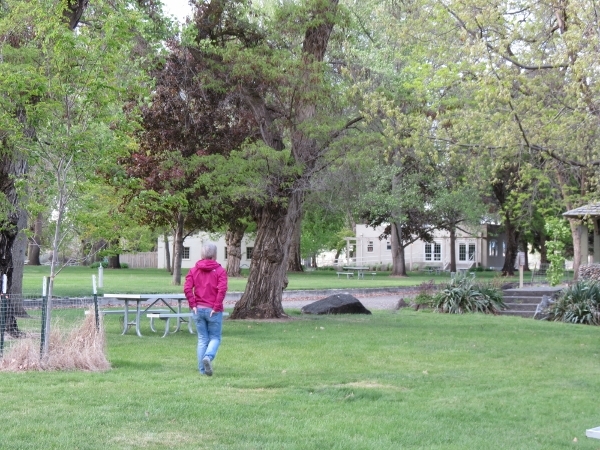 People were arriving to camp for the weekend as we walked about.